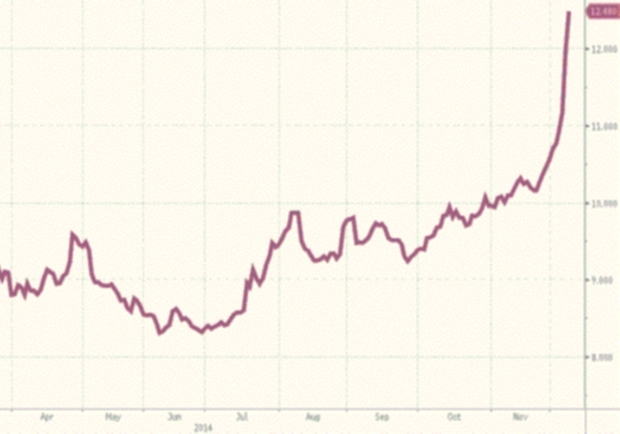 The Russian bond yield is soaring due to perceived risk. First, the Organization of Petroleum Exporting Countries failed to agree on a reduction of oil production quotas. Saudi Arabia, which in the past has been the “swing producer” for OPEC, often reducing its oil output during periods of weak demand, this time insisted on maintaining its production at current levels despite the fact that oil prices have plummeted more than 40 percent just since mid-2014. The Saudi aim, clearly, is to increase market share at the expense of higher-cost producers, including the hydro-fracking and tar sands producers in the U.S. and Canada. Another major result, and at least partially an aim, is to undercut the budgets of competing oil-producing countries such as Iran, Russia and Venezuela, de-stabilizing the countries politically. Second, the U.S. Bureau of Labor Statistics reported on Dec. 5 a “surge in job creation” for the month of November. “A resurgence in U.S. hiring accelerated in November and put 2014 on track to be the healthiest year for job growth since 1999,” AP reported. This assessment is exaggerated, to say the least. There are 6.9 million people with part-time jobs who want full-time work—up from 4.1 million before the “Great Recession.” And millions have given up looking for work. That has been a factor in the declining unemployment rate, now at 5.8 percent. Once people stop seeking a job, the government no longer counts them as unemployed. A broader measure of unemployment that includes involuntary part-time workers and people who haven’t worked or looked for a job in up to a year now stands at 11.4 percent. In addition, the number of unemployed people who have been out of work for more than six months is 2.8 million, more than double its pre-recession level. While at first glance, these two developments appear to be in contradiction with one another—the first appearing to reflect economic weakness and the second economic strength—the reality is that while the divergence is real, both trends are linked with a persistent rise in value of the U.S. dollar. And this exposes a fundamental weakness of the current “dollar standard” compared to the previous “dollar-gold exchange system,” in which the dollar was tied to gold at a fixed exchange rate of $35 per ounce. The current economic trends are somewhat reminiscent of trends in the global economy in the 1980s and 1990s, when the world was also on the dollar standard. 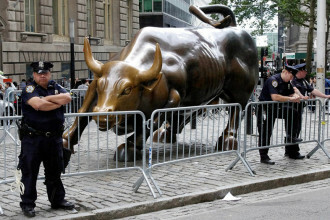 That roughly two-decade-long era, during which neo-liberal policies were imposed by virtually all capitalist governments, is often referred to by economists as the “Great Moderation.” During that era of moderate economic growth, which emerged out of the disastrous inflationary period of the 1970s, the U.S. dollar appreciated considerably, though it never gained back the value in gold terms—about 28 ounces per thousand dollars—it enjoyed prior to President Nixon’s abandonment of the gold standard altogether in 1971. In fact, at the U.S. currency’s strongest point in 1999-2001, a thousand dollars represented about four ounces of gold—the money commodity and universal measure of value under modern-day capitalism. However, that was a rise of almost 300 percent from a little more than one ounce that a thousand dollars represented in January 1980, when the U.S. faced the imminent threat of a complete collapse of its currency. Had that collapse not been averted as a result of the “Volcker shock,” a huge rise in interest rates engineered by the Federal Reserve System under Chairman Paul Volcker, it would likely have spelled the end of the U.S empire. That is because financing the empire’s huge costs, especially its military outlays, depends on the continued role of the U.S. dollar as the world’s main reserve currency. That role, which allows massive printing of money without runaway inflation, will continue as long as virtually all primary commodities including oil, and the debts generated by international trade in those commodities, are denominated in dollars. Much if not most of the gain in the dollar’s gold value during the Great Moderation was the result of a strong, sustained rise in gold production worldwide over that period. The basis for that rise was laid by a sharp increase in the purchasing power of gold during the 1970s, owing to the soaring dollar price of gold in those years, which greatly increased the profitability of the gold mining/refining industry. The rise in gold production enabled commercial banks, backed by the Federal Reserve and other central banks, to expand credit at an unprecedented rate during the 1980s and 1990s—even as the dollar appreciated in value preventing another bout of runaway inflation. Following the peak in the dollar’s gold value around the turn of the current century, the dollar once again began to depreciate and gold production turned down. By the time of the boom preceding the Great Recession, the dollar’s gold value had dropped from about four ounces per thousand dollars to a little under one ounce—around the same level it reached during the dollar’s January 1980 near collapse. Following the Great Recession of 2007-2009, and making possible the subsequent recovery, such as it has been, the gold value of the dollar plunged again, to about half an ounce of gold per thousand dollars. As a result of this further devaluation, the purchasing power of gold and the profitability of gold mining/refining once again rose sharply, inducing a renewed rise in gold production to a new record in 2013, continuing into this year. As during previous periods of rising gold production—most famously following the major discoveries of gold in California in the mid-19th century—credit can again be expanded without depreciating the currency and causing runaway inflation. Reflecting this fact is the current very low rate of interest on both government and private debt. This time, however, there is no sign of major new gold discoveries or technological breakthroughs enabling a further substantial rise in gold production. There were also no such discoveries or breakthroughs during the 1970s. However, though a good deal of private debt was paid off or otherwise liquidated during and subsequent to the Great Recession, the debt taken on by governments at all levels has continued to increase. This is due to the expense of bank bailouts, reduced revenue from taxes, and increased outlays owing to high levels of unemployment, and it has occurred despite harsh austerity measures imposed by virtually all capitalist governments. That means less, probably much less, room for credit expansion in the period ahead, including by the U.S. government. Expansion of credit enables and prolongs overproduction of commodities in relation to the market—the very definition, for Marxists, of the “boom” phase of the industrial cycle. As with all previous such expansions, sharply rising interest rates will signal its imminent end and the start of a new overproduction crisis—with the soaring unemployment, personal bankruptcies, evictions and increased homelessness such a crisis typically imposes on the working class and even parts of the middle class. For now, however, in view of current extremely low interest rates, that end is not yet in view. Therefore, a new overproduction crisis/recession is probably not imminent—assuming no major policy blunders by the Federal Reserve and other central banks. One such blunder would be to allow the dollar to appreciate so much that a downward spiral of prices in general, not just for primary commodities, takes hold. This would cause buyers of commodities to hold off purchases in anticipation of still lower prices. While such a deflation would lower the cost of living for workers, that would be balanced out by a likely big rise in unemployment as capitalists were forced by the shrinking market to cut back production. An appreciating dollar also makes debts denominated in dollars more difficult to pay off. That is the case domestically but even more so internationally, since the euro, yen, ruble and other currencies have been falling against the dollar. It was no accident that the savings and loan crisis hit in the United States in 1986 to 1995 as the dollar appreciated. Or that Mexico suffered a big sovereign debt crisis in 1994, and the “Asian flu” crisis of 1997 broke out and then spread to Argentina and Russia. Recall that the Russian ruble collapsed in 1998, during that “strong dollar” era, causing the nationalist faction of the new capitalist rulers of Russia to get rid of Boris Yeltsin and bring in Vladimir Putin. This brings me to the other side of the divergence between a strengthening U.S. economy and economic weakness elsewhere—which along with the appreciating dollar has caused prices of primary commodities including oil to plunge. Even short of a generalized deflation, the current fall in prices of oil, natural gas and other primary commodities can again by themselves cause major problems for the global economy, not to speak of political problems for the affected countries—many already targeted for regime change by U.S. imperialism. ”The rouble rout has sparked concerns that Russia could be heading towards a currency crisis —or even a financial crisis in extremis—and rattled the local government bond market severely. “The benchmark 10-year bond yield has jumped another 45 basis points to 12.42 per cent [compared to under 2.2 percent for the U.S. 10-year bond—JB] today—the ninth uninterrupted day of increases in Russia’s borrowing costs. 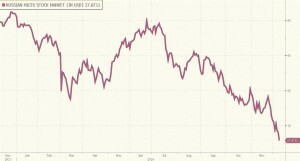 “The local Micex stock market index has also begun to sag, falling another 2.6 per cent today in local currency terms. 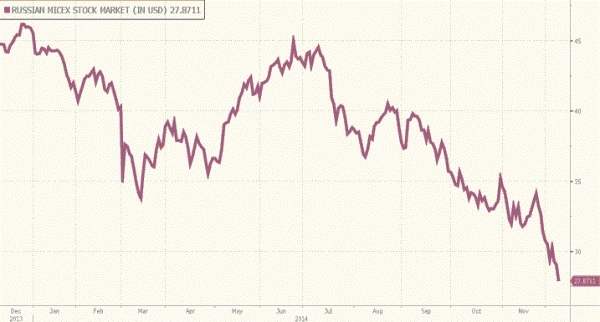 In US dollar terms it is at its lowest since mid-2009. “Even Russian officials admit that the economy will struggle to grow next year, as western sanctions continue to bite and the oil price slide weighs on the country’s finances. But many analysts are far more gloomy. “[S]tores are increasingly low on stocks. Women clutching babies often dash out to buy diapers and detergent, currently two of the most coveted products, whenever they hear some have arrived. “Meanwhile, many of the signature ‘Inside the Barrio’ medical outposts are closed or lack adequate equipment. “The United States Congress has passed a bill which would impose sanctions on Venezuelan officials found to have violated protesters’ rights. “The vote was passed by the House of Representatives and received similar approval by the Senate earlier this week. These and other measures imposed on Venezuela by the U.S. are really aimed at dividing supporters of the government and increasing mass misery to facilitate the overthrow of the Chavista government of Nicolas Maduro—the U.S. aim right from his installation after Hugo Chavez’s death. Finally, in the United States, not only smaller companies involved in the fracking boom in North Dakota and Texas but also the banks that have lent to them could go belly up or suffer major losses. On the other hand, lower prices for gasoline and heating will put extra money in the pockets of consumers and lower the cost of production and transportation for airlines, railroads and trucking companies. That is likely to boost the U.S. economy. The question remains: Is a new “Great Moderation,” or even a lesser “Great Moderation” in the cards? It is theoretically possible, especially if there is a new, or series of new, major gold discoveries or technological breakthroughs enabling a continued rise in gold production. Short of that, however, as already indicated it is largely excluded. The great productive capacity of modern capitalism will inevitably exceed the capacity of the market to absorb the commodities produced. Once credit expansion has once again reached its limit and interest rates—basically set by the market and not by the Federal Reserve—soar upwards, a new crisis of overproduction will be on the immediate agenda. Meanwhile, the current mass struggles, especially those fighting racist police brutality and for livable wages, decent working conditions, needed benefits, and the right to a union for low-wage workers, can take advantage of the current period of “average prosperity” and the coming “boom” phase of the industrial cycle to make significant gains, provided the movements stay in the streets and steer a course independent of the capitalist ruling parties.